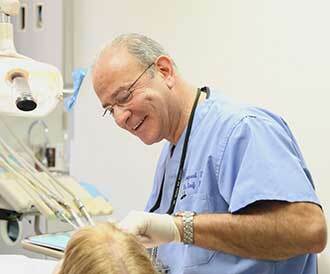 Dr. Berdj Kiladjian Specializes in Prosthodontics and Implant Dentistry. Dr. Kiladjian is board eligible with the American Board of Prosthodontics. He received his D.M.D. from the University of Connecticut, and was honored with acceptance to the highly prestigious training program at the Royal College of Surgeons in England, where he trained in oral and implant surgery. Dr. Kiladjian received his Certificate of Post Graduate Study in Maxillofacial Prosthetics from Indiana University. He has served as Director of Removable Prosthodontics at the Harvard School of Dental Medicine and lectures extensively on both national and international levels. Dr. Kiladjian’s varied clinical experience, as well as advanced training with dental implants has positioned him as one of the most extremely qualified in the construction of complex, permanently fixed and removable prosthetics in the Boston area. Dr. Kiladjian is considered an authority in advanced restorative techniques and has taught at the postdoctoral level for Harvard, Tufts and Indiana Universities. He is most noted as the President and founder of the Armenian International Dental Association, which is responsible for the creation, maintenance and funding of 5 dental clinics in rural Armenia. He is also the President of the Armenian Dental Society. Dr. Kiladjian is a past president of the American Academy of Dental Science, the Mass section American College of Prosthodontists, the Armenian American Dental Society and is a founding member and past president of the Armenian International Dental Association. He maintains active membership in national and international dental organizations. Dr. Kiladjian founded the Longwood Dental Group practice nearly two decades ago with a vision to establish one of Boston’s first comprehensive dental offices where an elite team of general dentists and specialists would have the ability to interact together and with their patients; providing a complete range of restorative dental care. Seventeen years later, the concept is a proven a success. Longwood Dental Group is one of the city’s largest dental practices, with a staff of 30 dentists, hygienists and dental assistants who treat nearly 7,000 patients. 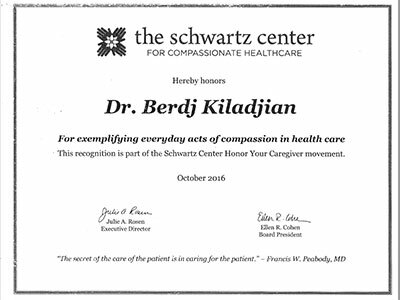 Dr. Berdj Kiladjian received the Compassionate Caregiver Certificate from the Schwartz Center for Compassionate Healthcare in October 2016. 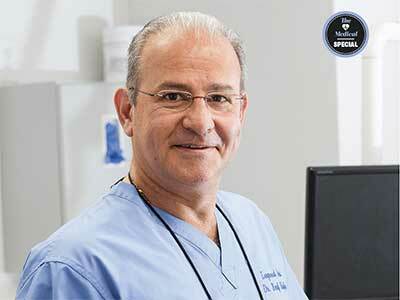 Dr. Kiladjian was honored for exemplifying everyday acts of compassion in healthcare. The Schwartz Center is a national nonprofit organization focused on strengthening the patient caregiver relationship. Through their Honor Your Caregiver program, their supporters make a donation in tribute to a doctor, nurse, or other caregiver who has made a difference in their or their loved ones’ lives. Humanitarian At Heart: Dr. Berdj Kiladjian inspires change through a spirit of service and leadership. The majestic beauty of the highlands of Nagorno-Karabakh, with its lush rolling hills and imposing mountains along the horizon, is a world away from Dr. Berdj Kiladjian’s bustling dental practice in Boston, Massachusetts. Every spring and fall over the past nearly twenty years, he is drawn here to the remote countryside in the South Caucasus, compelled to help his fellow Armenians in the best way he can. Read the full article at The Insider – A Publication for the Armenian General Benevolent Union Alumni and Friends or download the pdf article here. Berdj Kiladjian, DMD, MSD was inducted as a Fellow of the International College of Dentists in Washington, DC on November 6, 2015. 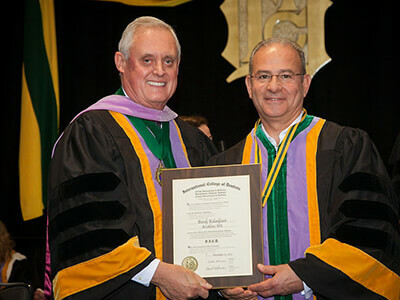 An honorary organization for the recognition of outstanding and meritorious service to the profession and community, the International College of Dentists presented Dr. Kiladjian with a gold key symbolic of this Fellowship for conspicuous service rendered in the art and science of Dentistry. The ICD, an honor society for dentists around the world, inducted 310 US dentists on November 6, 2015 in an impressive cap & gown ceremony held in Washington, DC. The prestigious Fellowship is awarded to Dentists who exemplify the ICD’s core values of Integrity · Leadership · Service. Dr. Berdj Kiladjian is a Prosthodontist and the Principal of Longwood Dental Group, Brookline and the founder of Hand In Hand, a non-profit, non-governmental organization dedicated to dental care and prevention education in Armenia and Karabakh – handinhand.am. 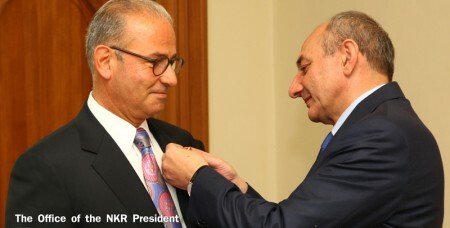 Dr. Berdj Kiladjian Receives Gratitude Medal For Services To The Nagorno Karabagh Republic. On October 15, 2014, the Artsakh Republic President Bako Sahakyan awarded Dr. Kiladjian with the “Gratitude” medal for his services to the Nagorno Karabagh Republic. Dr. Kiladjian chairs the Board of Directors for Hand In Hand, a non-profit, non-governmental organization dedicated to the improvement of the health and social welfare of the Artsakh population, focusing on dental care and preventative education in Armenia and Karabakh. The organization started in 1998 with the establishment of their first dental clinic in the war-devastated historic town of Shushi. Hand In Hand has successfully built six dental clinics in different regional centers of Artsakh, a mobile unit for rural Artsakh and one women’s health clinic in the Capital, Stepanakert.